The wind. It roars through the valley of Stowe, VT, like a creature possessed, a steady blast that spikes upwards of 50 miles per hour. It’s the same wind that made landing in the small Burlington airport in a small plane a white-knuckled descent, a successful landing that triggered spontaneous applause when we hit earth. The same wind that was part of a massive storm system stretching from the Mid-Atlantic to New England that made my departure from Washington, DC, a rocky, stomach-dropping experience. The same storm that grayed the skis and spit snow and ice at Vermont as if the state had somehow offended Mother Nature. The same storm that blew walls of snow in blinding white clouds off the ground and across I-81 as I drove from Burlington to Stowe Mountain Resort. And thank the heavens that I was in Vermont, and close to some of the state’s finest—and most sought-after beers. It would all start with a four-pack of Focal Banger Double IPA along with a four of Lawson’s Sip of Sunshine, both acquired at Stowe Beverages, a friendly liquor store five or so miles from the mountain base. But who knew my time there would introduce me to a new, secret brewing project that would leave those cans in my hotel fridge (well, at least till I had to pack). I was there to check out the new GMC Sierra AT4, a comfortable beast of a truck with everything you’d need to brave the winter roads of Vermont. And to ski, ice fish, and snow mobile in the area while driving that truck and the Sierra Denali, which boasts a higher-end, less-rough-and-tumble interior but still possesses all the rugged features of the AT4. Turns out, the weather made everything—save driving—a frigid and nearly fruitless endeavor. Ice fishing in single-digit temps with a wind racing upwards of 60 miles per hour across a frozen lake convinced me that this activity demands beverages, but the early hours that hosted the event made tossing back even a few session beers seem like a risky gamble. It was c-o-l-d, and the only aerobic activity consists of jigging your line—basically shaking the short rod with a less-than-deft flick of one wrist. The conditions were so raw that the resort was forced to close some of the ski lifts, so after ice fishing I managed to ski where I could until I lost feeling in my toes. The temps rose into in the teens the next day, with less wind—downright balmy compared to the previous day. Snowmobiling was still pretty arctic, but the resort opened the gondola, which offered some much-needed shelter from the world outside. And though spring has since come to Vermont, melting the snow and ushering in what is sure to be a truly epic mud season, those frigid days in Vermont live—as if trapped in a frosted bottle—in my memories as evidence of both the East Coast’s notorious winter conditions and as proof of the immeasurable value of finding welcome shelter from the storms. And after each harrowingly cold day, the Solstice Restaurant at Stowe became my refuge, in part because it was attached to the Lodge at Spruce Peak where I slept each night, meaning I didn’t have to brave the temps to walk to other spots in the pedestrian village. But even if you don’t bed down at the lodge, Solstice still justifies the minimal effort to visit. The beer list reads like a Vermont brewery hall of fame, including the Alchemist Focal Banger DIPA as well as brews from Lost Nation, Lawson’s, 14th Star, Collective Arts, Burlington Beer Co., Ten Bends, Zero Gravity, Fiddlehead, Switchback, and Hill Farmstead in both cans and on draft, sitting alongside some unexpected imports like To Ol beers from Denmark and a funky Scottish ale from Dieu du Cieli out of Quebec. The wine list is equally robust, and nicely compliments the rotating menu of dishes like roasted bone marrow, venison loin, and the crispy brussel sprouts served in a tiny cast iron skillet. Even the cocktail list temps, with offerings like a house-barrel-aged Negroni made with Private Label Tom Cat Gin, Campari, and Carpano Antica as well as a gin and tonic program with three versions of that classic cocktail. Dine in the restaurant proper, and you get the full menu. But my exhaustion typically had me shoulder up to the bar at the Hourglass, a wrap-around lounge just outside of Solstice, which offers traditional ski après grub (think big burgers, chicken wings with a trio of sauces, and those same delectable Brussel sprouts) as well as the full beverage program. But it was one waiter at Solstice that I met that first night that was kind enough to guide me to arguably the best discovering my 72 hours at the resort. He lives about 20 minutes from Hill Farmstead Brewing, and his close relationship with that small-output brewery helped the restaurant secure a few true rarities from Hill Farmstead’s Wunderkammer Bier, a side project started by the head brewer and the production manager. The ingredients for each edition (or “volume” as they like to call it) are hand-foraged in the Vermont countryside in a single day, then brewed and bottled in incredibly small batches with artful labels that also spell out the unlikely ingredients as well as the day they were harvested. Hourglass carries two Wunderkammer—at least they did this March. 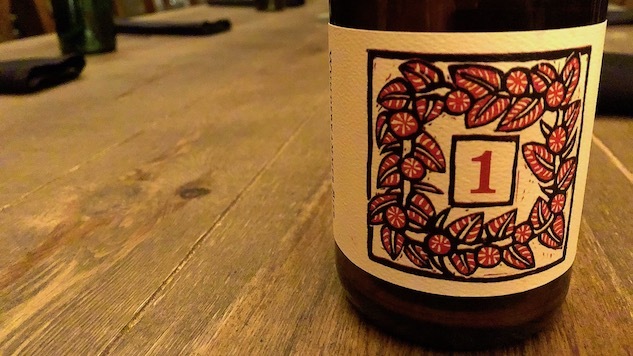 The wordy Embroidered Bird Motif 19th Century Motif, the 14th volume in the release, is a yarrow ale brewed and fermented with mixed cultures that creates a tart, funky brew that delivers hints of pink grapefruit as it warms. It proved crisp and refreshing and earthy (in a good way). But Gathered #1 beat all comers on the beer list. This American wild sour is brewed with mixed cultures, aged on oak, and conditioned with Coltsfoot, bramble leaf, golden rod, and chanterelle mushrooms—all gathered on August 5, 2018. Complexity reigns, with earthy, funky notes from the bramble leaf and the fungus that’s almost over-powered by a bold explosion of puckering sourness. But it’s also imminently approachable; a toney couple sitting next to me who loved wine (and touring vineyards all over the world) eschew beer, but gave the Gathered #1 a try and were instant converts. It tastes like Vermont in a glass, a far cry from the hop bombs for which New England is famous and one of Vermont’s best beers, hands down.